The Corporation for the Defence of Water, Territory and Ecosystems CORDATEC - San Martín, Cesar, denounces the grave risks that fracking (Hydraulic Fracturing) places on the water and moors (páramos in spanish) in the areas surrounding Bogotá, the capital city of Colombia. Civil society groups have called for a nationwide effort to demand that the Government applies a Precautionary Principle and declares a moratorium on the controversial extraction technique as a first step towards prohibiting it nationally. 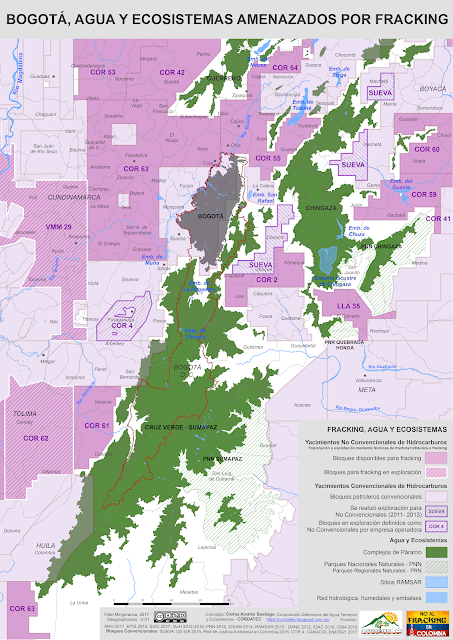 Despite the ongoing resistance of the community of San Martín in the province of Cesar, or reports such as those from the Environmental Protection Agency (EPA) of the United States, which conclude that "fracking would have a harmful impact on water bodies", nor the warnings of the Comptroller General of the Republic of Colombia which has asked the National Hydrocarbon Agency "to refrain from signing contracts for the exploitation of non-conventional oil deposits," the government has failed to take the necessary measures to prevent the environmental and social impacts that fracking could bring to Colombia. While on the one hand President Santos and his Government adhere to international commitments under the Paris Agreement and Sustainable Development Objectives, in Colombia fracking has already been set in motion: In San Martín, the companies ConocoPhillips and Canacol Energy are in the process of carrying out exploration works in the VMM3 block, specifically in the PicoPlata1 well. The work is taking place in spite of the rejection of the community of San Martín and warnings from the Comptroller's Office, which found irregularities and illegalities since the beginning of the works in October 2016. But this project is only the tip of an iceberg which will threaten the water and strategic ecosystems of the people of Bogotá. Several media outlets such as Noticias Caracol, Semana Sostenible, Colombia Plural and Contagio Radio, have highlighted that around 43 blocks of non-conventional deposits in the country are destined for exploration and production through fracking. This technique could have a potential impact in at least 300 municipalities around the country. Seven of these blocks have been granted contracts which provide a clear path for the application of this technique in Colombia. Just a few weeks ago we denounced that the National Hydrocarbon Agency (ANH) acknowledges that there are two new contracts for fracking in progress, which would increase the areas of the country that would be affected. Something the National Agency for Environmental Licenses (ANLA) denies. As well as the quantity and spread of the designated blocks, it is also worrying to find out about the specific areas which have been designated for the application of this technique. 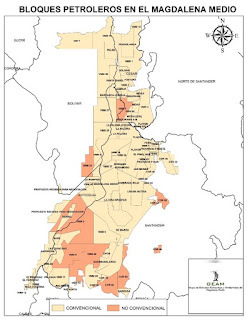 Various allegations made over the years by the ‘Association of the Mountain’ about potential ‘secret’ explorations for fracking in the municipality of Guasca, and information available from official sources, suggest that fracking would pose a very serious threat to several strategic ecosystems such as those in the moors of Sumapáz, described as the agricultural pantry of Bogotá and recognised as the largest moors in the world; The moors of Chingaza, an ecosystem which supplies about 80% of Bogotá's drinking water, not to mention other ecosystems such as the marsh and wetland complex in the south of Cesar. 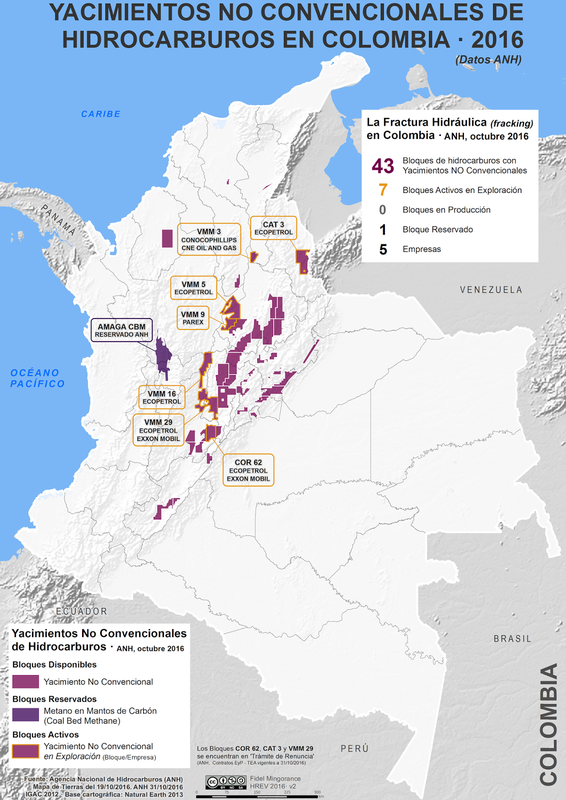 In the context of this bleak panorama, the Alliance for a Colombia Free of Fracking addressed a letter to President Santos, requesting, as a matter of urgency, a moratorium on hydraulic fracturing in Colombia. According to Camilo Prieto, a spokesman for the Colombian Environmental Movement and winner of Titanes Caracol in the category for Environmental Sustainability, "Fracking is a threat to the nation's water future, which irreversibly contaminates millions of litres of water. There is no study demonstrating that wastewater can be treated for safe disposal. " 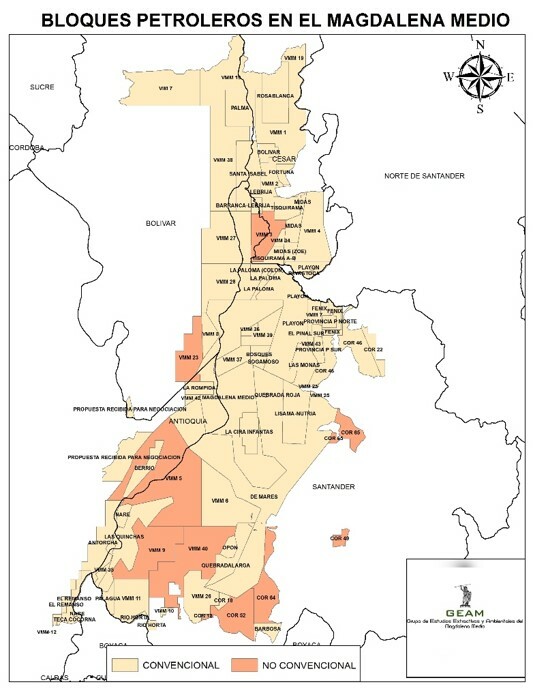 Although the oil companies’ interests for the implementation of the Fracking in our territory is in the Middle Magdalena and the Eastern Plains, the fact that there are blocks currently used for exploration and non-conventional exploitation in a mountain range zone in the centre of the country raises warnings about potential risk for the contamination of the water of millions of inhabitants of the Savannah of Bogota. According to Tatiana Roa, General Coordinator of Censat Agua Viva - Friends of the Earth Colombia, "the oil frontier that is making its way towards the central Andean mountain range threatens not only water-rich and agricultural territories but it also the most densely populated areas of the country, which could provoke deep socio-environmental conflicts". The first map shows that Bogotá, nearby municipalities and their main water sources are surrounded by oil blocks, the vast majority of them destined for non-conventional methods or fracking, as is the case with the moors of Santurbán and Caño Cristales. The map demarcates the extent of corporate greed, which seems to have no limits. "We carried out this investigation and filed this complaint to show that fracking is no longer the problem of a few communities in the south of Cesár and Santander. The time has come for us, as children of the same earth, to unite in a single voice in defence of water and life, and to tell the National Government that we are not willing to give up water for oil or mining in Colombia,” concluded Carlos Andrés Santiago from CORDATEC, which has repeatedly denounced threats to leaders who oppose the project, including several attacks by the National Police's Mobile Anti-Riot Squadron (ESMAD). The Alliance for a Colombia Free of Fracking calls on individuals, companies and organisations around the country and around the world to join this cause, to follow the fanpage in order to stay informed about the next steps, and to join the activities planned nationwide.